HINT: Software from MANAdev provides tools to achieve various SEO goals. Different stores need different SEO strategies, what is good for small store, might be not so suitable for a large, there is no one recipe for all cases. We do suggest our vision which is based on best Google practices. However there is nothing better than good, unique and quality content be it CMS, category pages, filtered pages, product pages or simply images of products. After installing, extension defaults are suitable for the most cases. But settings can be changed easily according to another vision. Do not to index filtered pages at all, but rather accumulate all search ranking on category pages. Extend set of indexed store pages with SEO optimized filtered pages. Our extensions allow implementing both strategies. Very flexible URL structure - whether you prefer flat URL structure, like domain.com/category-filter-option or nested, deep directory structure like - domain.com/category/filter/option or ... - all is achievable with our extensions, there are many settings for it. A powerful tool for multilingual URL construction. For example German specific symbols can be replaced by Latin symbols or their combinations. A lot of Canonical URL settings. SEO Schema is a collection of settings, which are currently acting in the store. Here you will find a list of store seo schemas. Other schemas are Redirect schemas or Disabled schemas. Copy current Active schema - press Duplicate button. Old schema will get Redirect status automatically. Disabled is inactive schema. If necessary, you can always change Redirect status to Disabled, although it is not recommended. While new schema is not finished, keep it Disabled, and after you are done, change it to Active. Redirect schemas are ones, which had been used some time ago, however, later on, new schema with different settings was created. To not loose already gained search engine traffic and for customers usability old type URLs by default are redirecting to new URL structure and so on. If you just change parameters, this URL will be valid and page will be accessible. However, if old page was indexed by Google, or customer had bookmarked it, those references will lead to 404 'Page not found' page, you might loose already achieved page ranking. To prevent it, new parameters should be set in new schema, while old schema should be redirected. This way old link will be redirected to the page with new URL. In most cases, there is no sense to modify Redirect schema and it is not recommended. Sample URL presents typical URL structure example, which is currently acting in your store. While parameters are changed, you can see live example of URL, which will be supported after schema is saved. This is visual facilitation of setting up parameters in order to achieve your goal. Name is any kind of a name you like. It is used just for you to remember, why schema was created and to distinguish it between others. Status - schema status. SEO schema can be Active, Redirect or Disabled. This field will be disabled for Active schema. You can set another Redirect schema as Active (after this active schema status automatically changes to 'Redirect'). Disabled is inactive schema. If necessary, you can always change Redirect status to Disabled, although it is not recommended. While new schema is not finished, keep it disabled, and after you are done, change it to Active. Symbols, which are used for filtered page URL generation, are listed here. You cannot use special URL symbols like "&", "? ", "=" . Separators can help to give the impression of catalog structure by using "/", for example, or flat structure with "-" for every SEO expert taste. It is your right to choose. Query Separator separate category from filter. Parameter Separator separate filters from each other. Value Separator is used between filter name and filter values. Multiple Value Separator - between filter options. Price Separator is used between price min and max values. Category Separator is used between categories, but only in case when category are used as filters (not recommended because of double content issue) and redirecting to categories is disabled. Redirect To Same Page With Correct Parameter Order. Yes is recommended in order to prevent double content issue. Double content issue appears when several different URLs show exactly the same result. For example, customer click on "Red", then on "Blue" color filter and get color-red-blue in URL. If customer selects the colors in opposite order, URL is color-blue-red. But product lists for those two different filters are the same. Therefore, if Yes is selected, options will be listed in one and the same order in spite of click order. Filter option order (red or blue goes first in url), as well as other filter specific settings can be set in Search Engine Optimization section of particular (in our example Color filter. More in details in Filter specific SEO parameters section. Redirect Applied Category Filters To Subcategory Page. Yes is recommended. 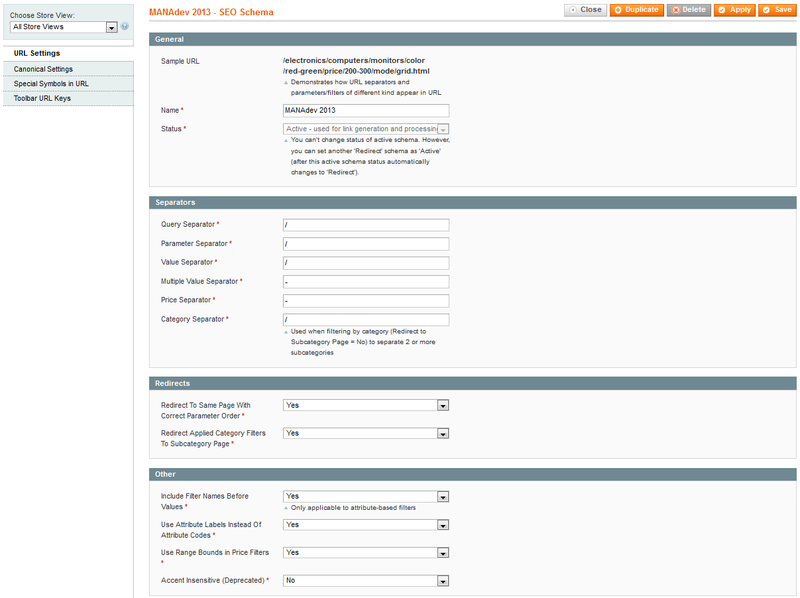 By default Magento category filter just do the filtering of the same page. Here is very thin and hardly understandable by many people difference between category page, filtered by subcategory, and subcategory page itself. For example, if in Electronics category we are filtering by Computers, we in fact are filtering Electronics page by Computers filter, which is not the same as Computers subcategory page. Although, those two pages have the same set of products, we are facing Double content issue problem when two different URLs shows the same content. So, very advanced feature of SEO Layered Navigation Plus extension by MANAdev is that, instead of applying filter, user can be redirected to real subcategory page, preserving all other applied filters and preventing Double content issue. Include Filter Names Before Values. If Yes is set you will get URL like domain.com/electronics-color-red. It is recommended to set to Yes because of less probability of URL key conflict. If No is set you will get URL like domain.com/electronics-red. Choose No, if you really understand what you are doing and you are sure that options are unique in whole store view. Exception: For Price type attributes filter name cannot be removed from URL. Exception: Category filter name, if it is used as filter (instead of redirecting to subcategory page) also cannot be removed from URL. Please read about URL key conflict before using this option. If there are no duplicated attribute options, by choosing No, you can achieve shorter and more elegant URLs. Use Attribute Labels Instead Of Attribute Codes. Yes is recommended for better URL readability and attribute translation support. It is more customer friendly, but in special cases, you can use No. Use Range Bounds in Price Filters. In most cases should be set to Yes, which allows to see min and max price range bounds in URL. No is used only for redirect schemas and used for compatibility with old extension version. Accent Insensitive (Deprecated). Should be always set to No. This setting will be removed in a future. Canonical Link Meta Tag on Category Pages. Yes is recommended. It will put canonical meta tag on category pages. You can remove canonical meta tag by saying No. Canonical Link Meta Tag on Quick Search Page. Yes is recommended. It will put canonical meta tag on quick search pages. Canonical Link Meta Tag on CMS Pages. Yes is recommended. It will put canonical meta tag on CMS pages, where layered navigation is used. Canonical URL Contains All Applied Filters. It's up to you, what to choose. Yes is recommended when you are interested in expanding your store with genuine filtered product collection pages. Canonical URL will point to the same filtered pages with applied filters. No is recommended when you are interested in only category pages - canonical URL will point to main category page. Canonical URL Points to the Page with All Items. You can refer to Google best practice View-all in search results, to make your choice, while our recommendation is Yes if category page contains reasonable amount of products. In this case canonical URL will point to view-all page, where all filter results are listed in one page without pagination. Otherwise, search results will be divided into page and first page will be used as canonical URL. Canonical URL Contains Page Parameter. Includes Page 2 on second page, Page 3 on 3rd page and so on into canonical URL. rel=prev and rel=next URLs on Paginated Product List Pages. If set to Yes, category pages will contain canonical meta tag pointing to next and previous pages. Never - leave canonical meta tag rendered as specified in Canonical URL section. There are some restrictions on symbols, that is used in URL, some of specific symbols are reserved for other purposes (";" , "/" , "?" , ":" , "@" , "&" , "=" , "+" , "$" , ","), some are incorrectly interpreted by search engines ("_"). This set of symbols will be used to replace one symbol with its substitutions. If you want to remove specific symbol from URL at all, you can leave Substitute field empty. Also, you can substitute one symbol to several characters. Here you can create substitutions for URL parameters, to get more readable URL for human beings. Magento generates URL parameters from product list toolbar, sorting and pagination, while you want to have them more understandable.. For example, you can see p=2 in non-SEO URL, but extension can convert it to page-2. Hint: URL key should be unique for every option in filter scope when attribute name is used in url, or globally for whole store view, if attribute name is not included to url. This tool is used to monitor URL keys, find and solve URL key conflicts. Here you can quickly find and overview store URLs. Also here you can change URL key manually if needed. If you know, that there is URL key conflict, filter the list by searching on problematic key. For example, let's find "brand" key. Write "brand" in URL Key and press Search again, this will narrow the list of URL keys. This way you get the list of pages where "brand" url key is used on particular store view. Select the record, you want to modify. This will open URL key window, where you can find general information about URL, which cannot be edited, as well as the field for manual overriding of URL key value. Description will tell you in human language, how this URL key is created, which attribute or category is the basis for this key and other important information about active rules. Default URL key - generated URL key, which is active when no manual overriding is applied. Actually Used URL Key currently acting URL key. If you want mark URL key to be used instead of current brand - type mark in Manual URL key and press Save button. URL key conflict happens when one and the same URL is used for different purposes. How to recognize SEO URL key conflict? After you had applied the filter, you saw "Please wait" message, but nothing was changed in the page, after message animation had been finished. Then, if you press F5 in order to refresh the page, you will get 404 'Page not found' page. This is first sign, indicating, that URL key conflict exists for this filter or option. You have attribute with code shoes_brand and attribute with code apparel_brand. You name both simply Brand. By default URL key for attribute = attribute name (only lowercase). When Magento reads URL and finds brand in it, it doesn't know which of 2 filters is applied - shoes_brand or apparel_brand. In such situation system returns 404 Page not found page. By default spaces in URL are replaces with - sign. And also Multiple Value Separator in SEO Schema is - sign. So when options Cotton and Polyester are applied URL is like domain.com/category/material/cotton-polyester. And when simply option Cotton Polyester is applied you get the same URL domain.com/category/material/cotton-polyester. Again, when Magento reads URL and finds cotton-polyester in it, it doesn't know which filter is applied, it might apply 2 options Cotton and Polyester instead of one Cotton Polyester. Keep attribute names unique per store view. Keep option names unique inside the same attribute. NOTE: It is not recommended to have different attributes of the same meaning for every attribute set, like 10 colors for every attribute set or 10 brands. Filter options in Layered Navigation depend on products in category (for better understanding how Layered Navigation works in Magento please read What is Layered Navigation in Magento topic, so you will not get shoe brands in apparel category and vice versa. Quick search page is also more elegant with a single attribute for color or brand, allowing to filter products with one color filter instead of 10 color filters. If you really need more than one attribute with the same name in your store, make URL keys unique manually in MANAdev -> SEO URL Keys. Alternatively, consider using attribute code instead of attribute labels option in active SEO schema. alternatively, consider changing space symbol with + sign or some other in Special Symbols in URL tab in active SEO schema (by default is is replaced with - sign).